For India’s farmers, doubling their annual income over a five-year period translates into enabling them to grow at more than 1.5 times the rate of the nation’s entire Gross Domestic Product (GDP) growth rate over the same period of time. This is no small feat in leapfrogging to be achieved in a country where a majority of its farmland is held by marginal farmers with holdings below one hectare. Given the size of the problem and the length and breadth of the value chain, there have been a lot of perspectives on technology and policy adoption in various parts of the agriculture value chain to achieve this feat. An NITI Aayog policy paper written by Ramesh Chand, ‘Doubling Farmers Income – Rationale, Strategy, Prospects and Action Plan’, provides an excellent insight into historical context of farm/farm-based in income in the country and the present status of agriculture. The paper recognizes major growth sources for agriculture in India, as well as improvement in productivity, resource-use efficiency and improvements in trade as some of the key drivers of growth for farm communities in the country. One can broadly classify the narratives for such suggestions (in technology and policy) into farm/farmer-centric options and opinions that focus on institutions that support farmers. For example, looking at how smartphones used by farmers can be leveraged for enabling direct sale of produce via digital marketplaces without third parties is a farmer/farm-to-consumer centric strategy. While these farm/farmer centric options have a direct impact to the community, we obviously will not stand a chance if we do not leapfrog our institutions that support farmers. The three pillars that support farmers in the entire lifecycle of agriculture from a monetary perspective are credit, insurance and trade institutions. While much of the discussion and debate today centers around institutions that are involved in producing better seeds, fertilizer and equipment for better farm outcomes, it is important to acknowledge that discussing the future of monetary institutions and trade aspects in both technology and policy is as necessary as every other aspect of the farm and farmers. In this regard, while there is a definite push towards e-governance and use of digital platforms for fixing several of the issues in monetary institutions and enabling further ease of trade, one of the key questions to ask is whether or not a lack of data is making monetary institutions shy away from granting loans or insurance at a scale and size of a country like India. One of the fundamental pieces of the puzzle in doubling of farm income is the ability to digitize records of both farmer and farm performance. The digitization drive will help monetary institutions in both credit and insurance to use scientific methods based on data analytics to disburse loans and clear insurance claims. In the real world, this means bank officers and underwriters sitting in their offices while having dashboards in their banking applications to review the performance of a particular farm or the farmer in question in assessing credit risk or redressal claim and with literally a press of a button addressing a case file in less than a couple of minutes. SatSure is one such company, which has been providing such information services to banks and insurance companies in India, by analyzing large amounts of satellite and weather data for delivering such information, like a credit score report. 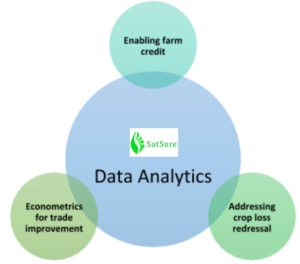 There are more companies following SatSure’s route of utilizing satellite Big Data for driving efficiencies in financing agriculture, as the global digitization drive is set to help both sides (farmers and monetary institutions). Gaining access to credit and insurance based on farm/farmer-level analytics will also mean fixing problems in fraudulent utilization of loans, as well as claims. For example, a bank providing loans for a particular crop can also have an automated flagging system for the entire lifecycle of the farm starting from sowing to harvest. This shall make sure that the credit is utilized effectively and will also give a perspective to the banker on the estimations of yield based, health of the crop, etc. 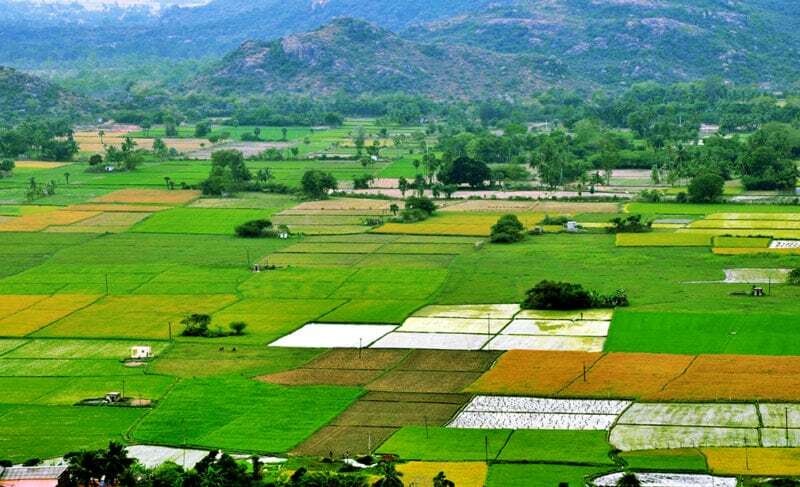 Similarly, an underwriter can get a perspective on the risks of monsoon, availability of irrigation, land fertility over time, and weather uncertainties over cropping period, providing complete transparency in sizing of the claim in the underwriting process. As the digitization-based fixes are applied for credit and insurance, the economic metrics of trade of farm produce becomes crucial to whole idea of getting the ‘real prices for farmers’. This is where there is a large scope for innovation given the advent of modern farm/smart farm equipment as well as lateral entry of new technologies such as Internet of Things (IoT), apps on smartphones, and to throw in the mix of farm-to-fork, farm-to-mill and farm-to-warehouse benefits for farmers to reap benefits directly. Here again, the forecasting based on analytics can help all of these efforts deploy effective supply chain strategies to ensure fair trade for farmers. The bottom line remains that leapfrogging farm income means strategizing to leapfrog every element that enables the fruits of a farm to trickle down without any friction to the farmer. 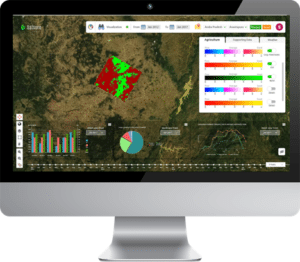 Satellites and predictive analytics solutions enable farmers to cultivate a better digital ecosystem around their businesses, and essentially, grow their income. The post How India’s Farmers Grow Profits with Satellite ‘Big Data’ appeared first on Via Satellite.